Kenneth Woods and the English Symphony Orchestra (ESO) return to Kings Place on Sunday, 28 April 2019, appearing on the London venue’s award-winning series Venus Unwrapped which focuses on female composers. The Czech-themed programme features works for string orchestra and piano by Antonin Dvořák, Vítězslava Kaprálová, Bohuslav Martinů and Wolfgang Amadeus Mozart. 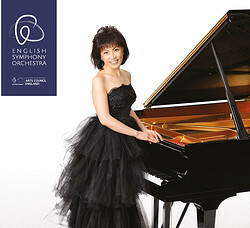 Pianist Noriko Ogawa joins the orchestra in this concert which is presented in partnership with the London Chamber Music Society. There is a love story at the heart of the ESO’s programme. Born in Brno in 1915, Kaprálová was a prodigiously gifted composer and trail-blazing conductor. Martinů, her teacher and mentor, was the leading Czech composer of his time. In the turbulent years running up to the outbreak of World War II, they fell in love. Their affair was marked by adversity, living in exile in France following the annexation of Czechoslovakia by the Nazis, and, tragically, her death from tuberculosis at the age of just 25. The programme features two Partitas – his for strings from 1931, and hers for piano and strings from 1939, which will feature pianist, presenter and activist Noriko Ogawa. Kenneth Woods remarks, “Kaprálová’s Partita shows her to be one of the great musical talents of her time. This is music of huge appeal and a profound quality. Had she lived longer, she would have taken her place among the 20th century’s greats, striding across the worlds of composing and conducting with equal command. Every work she wrote was a real treasure, this one perhaps most of all.” Martinů’s Partita elicits a kaleidoscope of colours and exhibits a strong Neoclassical influence. The Kings Place series Venus Unwrapped is a year-long, multi-genre celebration of music by female composers and creators. Woods and the ESO are prolific advocates for music by women composers and in recent years have performed, premiered and recorded to great acclaim works by Deborah Pritchard, Kaija Saariaho, Emily Doolittle and Thea Musgrave. In March 2019, they celebrated International Women’s Day with a performance of Polish composer Grażyna Bacewicz’s magnum opus, Concerto for Strings. Woods and the ESO return to London on 9 June 2019 for a performance at Cadogan Hall featuring the world-premiere of the third work in the orchestra’s ground-breaking 21st Century Symphony Project, Symphony No. 5 by Matthew Taylor. The programme also includes Felix Mendelssohn’s Violin Concerto with violinist Pavel Šporcl and concludes with another Fifth Symphony, that by Beethoven.